When asked for SF restaurant recommendations, we often state that the ultimate experience that everyone should try — at least once — is Atelier Crenn, Chef/Owner Dominique Crenn’s two Michelin-starred place in the Marina. It’s definitely a splurge, but the modernist-leaning “poetic culinaria” is definitely worth the journey. 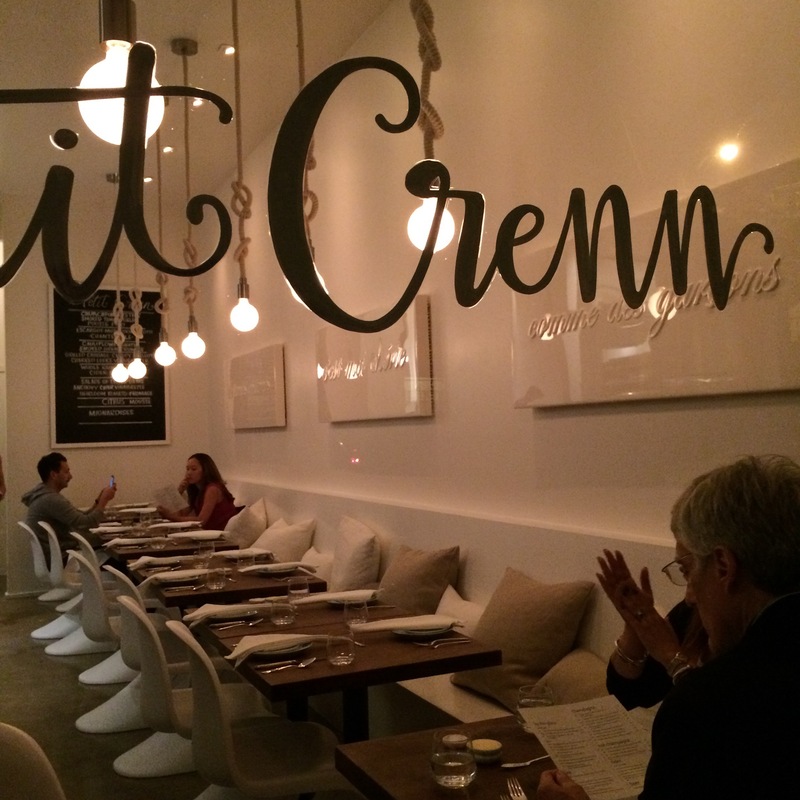 Based on our great experiences there, we grabbed reservations at her lower-end, more casual and highly anticipated restaurant, Petit Crenn, when it opened in Hayes Valley last August. Taking over Bar Jules, Petit Crenn has space for 28 diners of multi-course set menus with two seatings (6 and 8:30 pm) plus room for 10 more at the bar for an a la carte drop-in dining experience. Due to the intimate space, most of the tables in the mostly white decorated dining room are set for four people. Their preference is that tables for two share a table with another couple, although they will separate tables on request. The five course set menu is a relative bargain at $72 when they opened (now raised to $79) which includes tip but not tax. It changes often based on ingredient availability and gets updated on both of the chalkboards that hang in the restaurant. The seafood-centric menu is very personal to Chef Crenn, taking inspiration from the cooking of her mother and grandmother from her ancestral home of Brittany (where she grew up). Even before the dinner starts, a few amuse bouche courses are delivered to the table by one of the servers, who may also be one of the chefs from the kitchen. In our case, we were lucky enough to have Chef Crenn deliver the excellent bites to our table on our first visit. First up were local anchovy filets that have been house cured in olive oil (left), bite-sized gougères (middle) and slices of an excellent rolled herbed omelet. The food is not prepared with the modernist techniques like those at her flagship restaurant, but the traditional French fare has definitely been updated with a more contemporary style. For example, the chilled Miyagi oysters came with a deliciously smoked tomato gelee that had the same consistency as the bi-valve. Wines are available by the glass or bottle, and the menu prices are also inclusive of service charges. 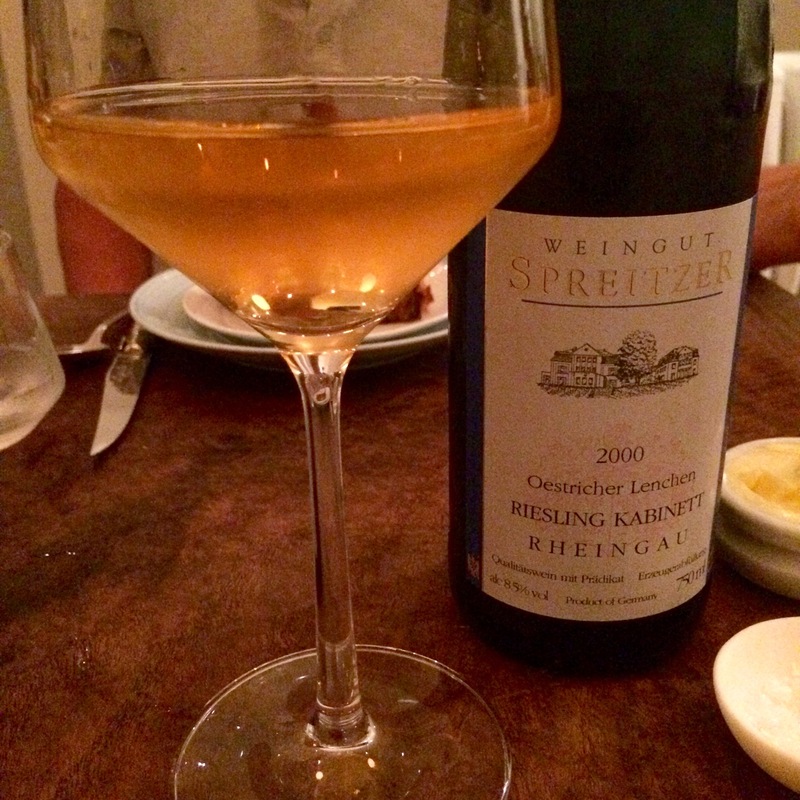 We knew we were in for a mostly seafood-centric meal, so thought that a food-friendly Riesling Kabinett would be the perfect pairing. Serving a 15-year old white wine is generally unheard of in most restaurants in the US, but it is common in France — and this bottle ended up being the perfect pairing for the food. The beautiful (and thin!) 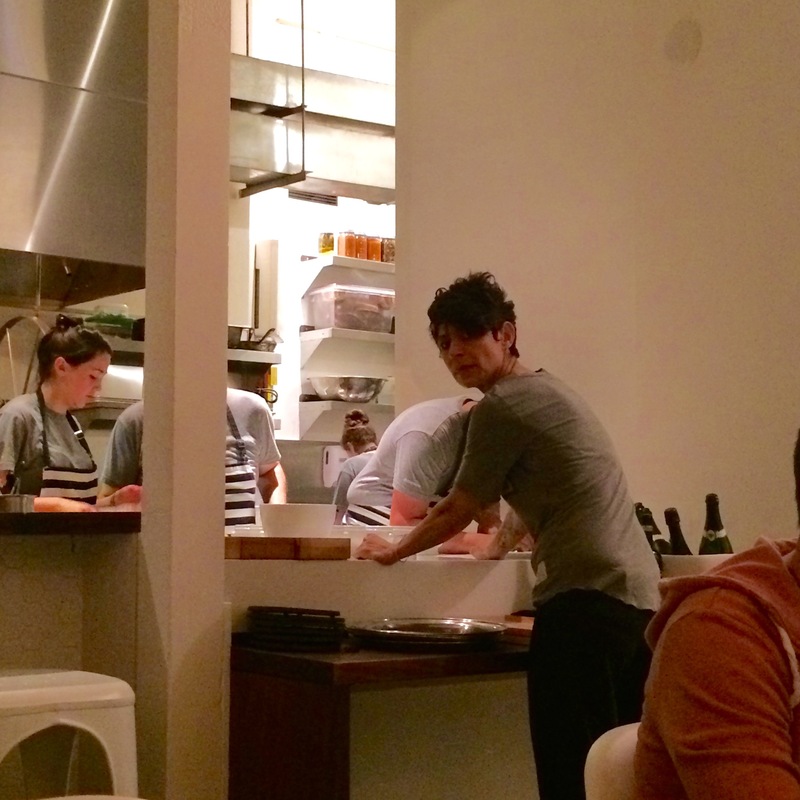 Owner/Chef Crenn was definitely a presence during their opening, but in our subsequent visits we noticed that she comes to the restaurant as service at Atelier Crenn winds down. She told us that she took over the whole building from Bar Jules, not just the restaurant, so perhaps she has a place to rest elsewhere in the building. 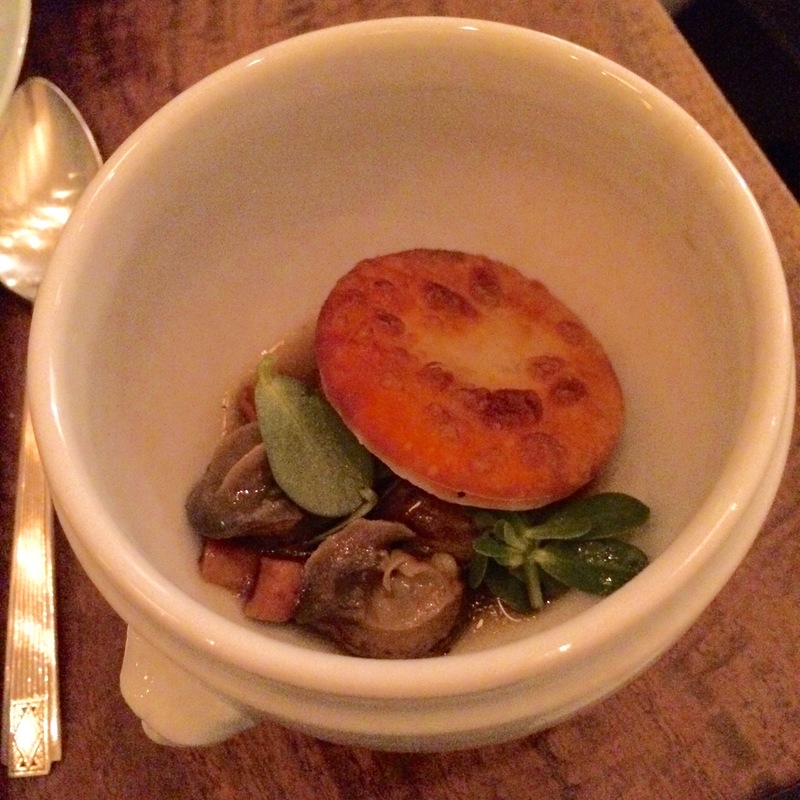 The delicate escargot dish served with a mushroom broth came with bits of chanterelles that matched the consistency of the snails. 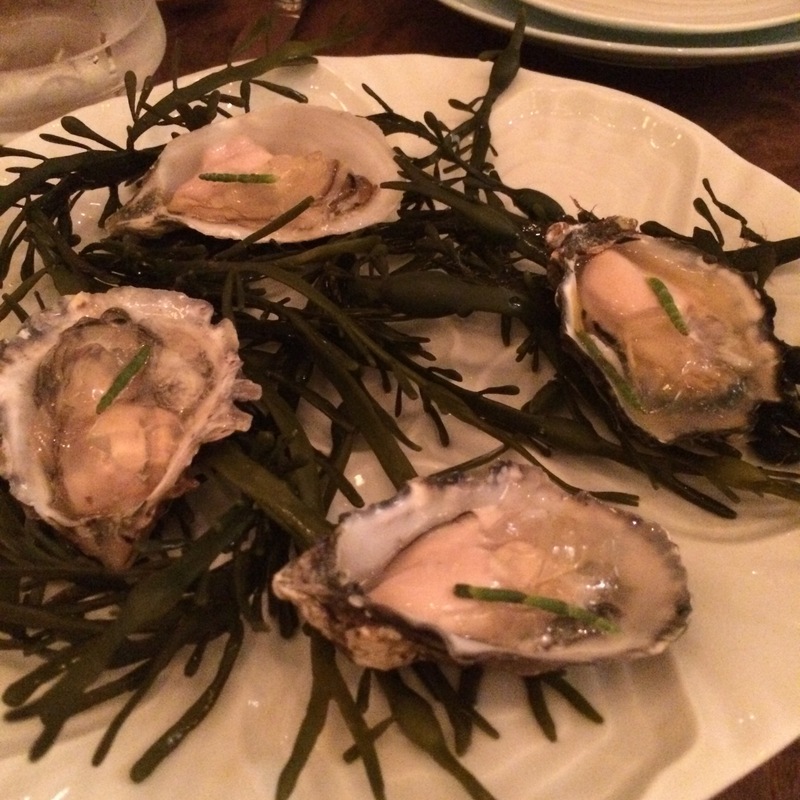 Capped with a crisp puff pastry “cracker,” this turf-based dish felt like it belonged within the seafood-centric menu. 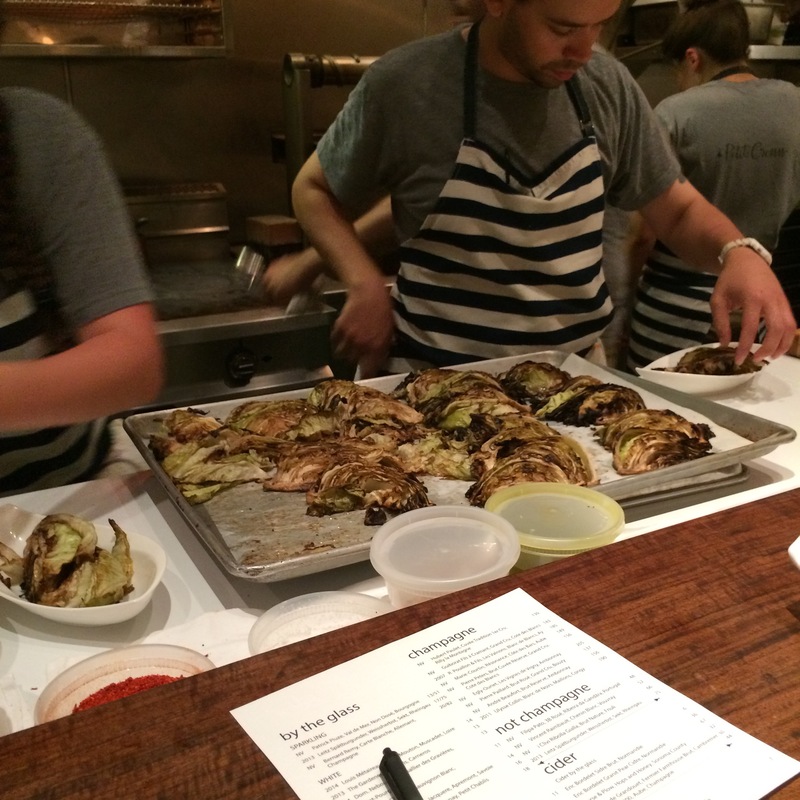 A bowl of grilled green cabbage dressed with a charred leek vinaigrette and finished with crispy shallots was truly revelatory. 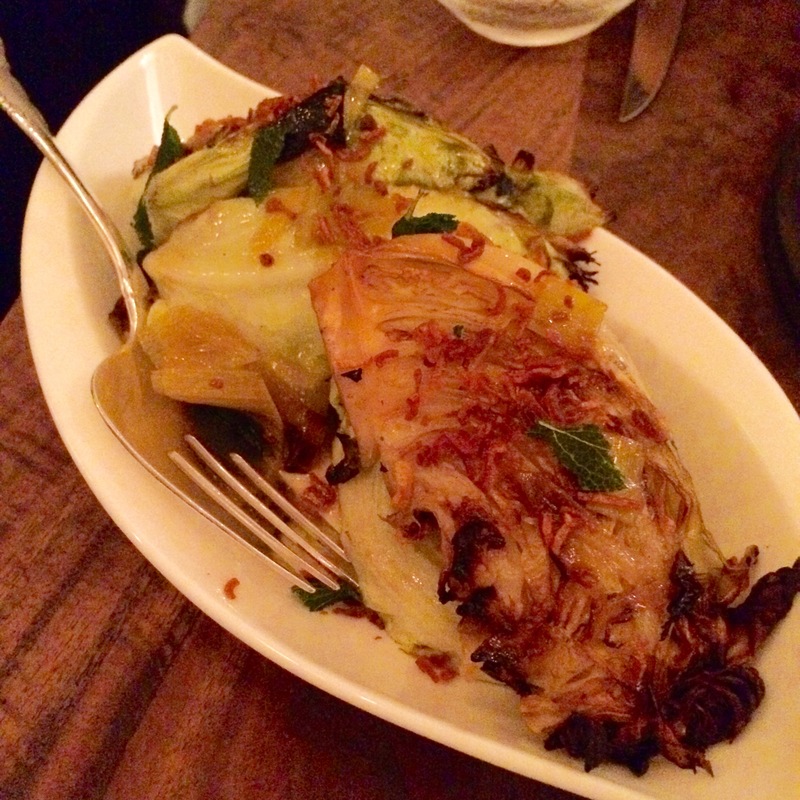 The char of the brassica brought out its sweetness while still holding enough crunch. Another vegetable dish, the grilled cauliflower gratin, arrived soon after the cabbage. The cream sauce and the smoked breadcrumb topping added a lot of flavor and texture to the still toothsome florets. 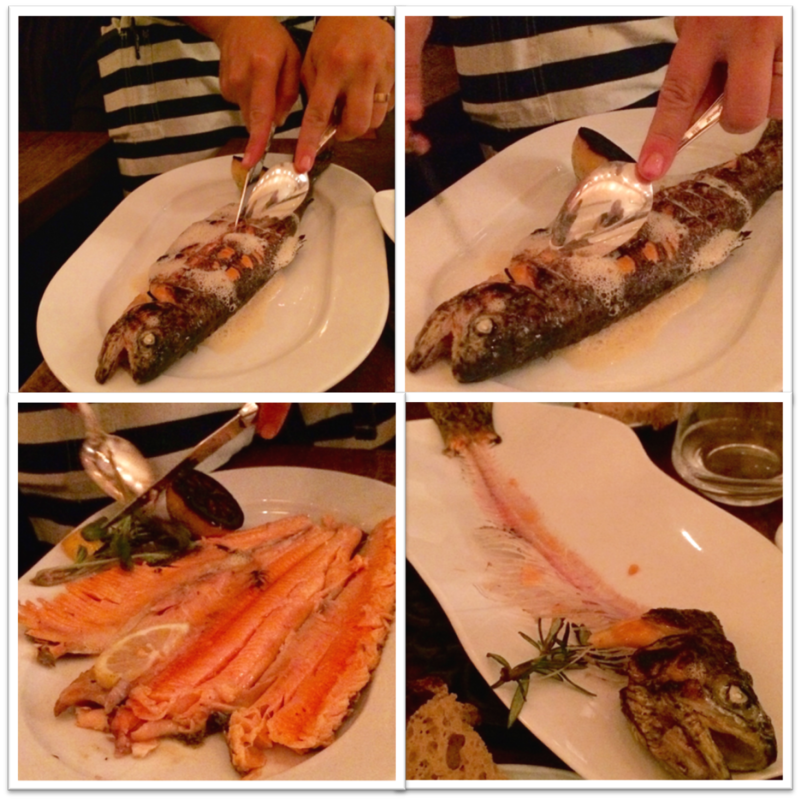 The fire-roasted whole trout was brought whole and deboned table-side, leaving a carcass which would have served as a great comb for the Flintstones. The air-dried and basket-grilled fish was flaky and full of flavor, especially when consumed with a dollop of the airy cider sabayon. 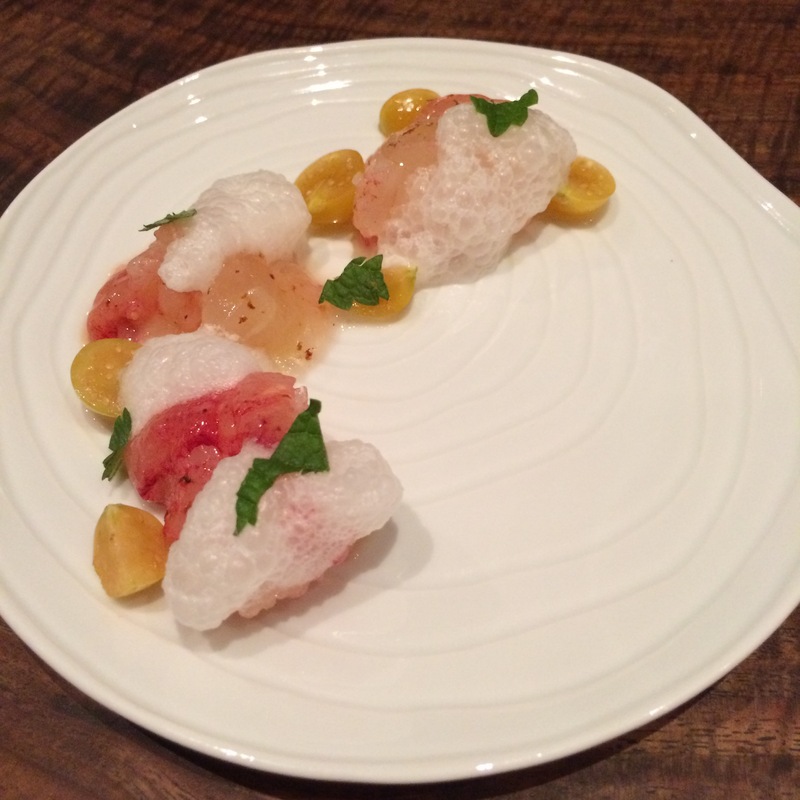 On a subsequent visit, Executive Sous Chef Aaron Thayer (also from Atelier Crenn) told us that they specifically order only pink-fleshed trout. 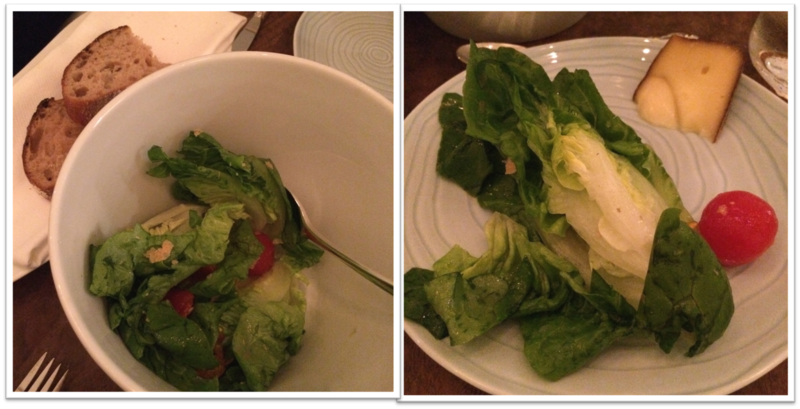 As in France, the salad comes after the main course, and this little gem version served with a peeled heirloom cherry tomato and simply dressed with an anchovy caper vinaigrette was refreshingly light. A chef also comes out and placed a slice of fromage on every diner’s plate. 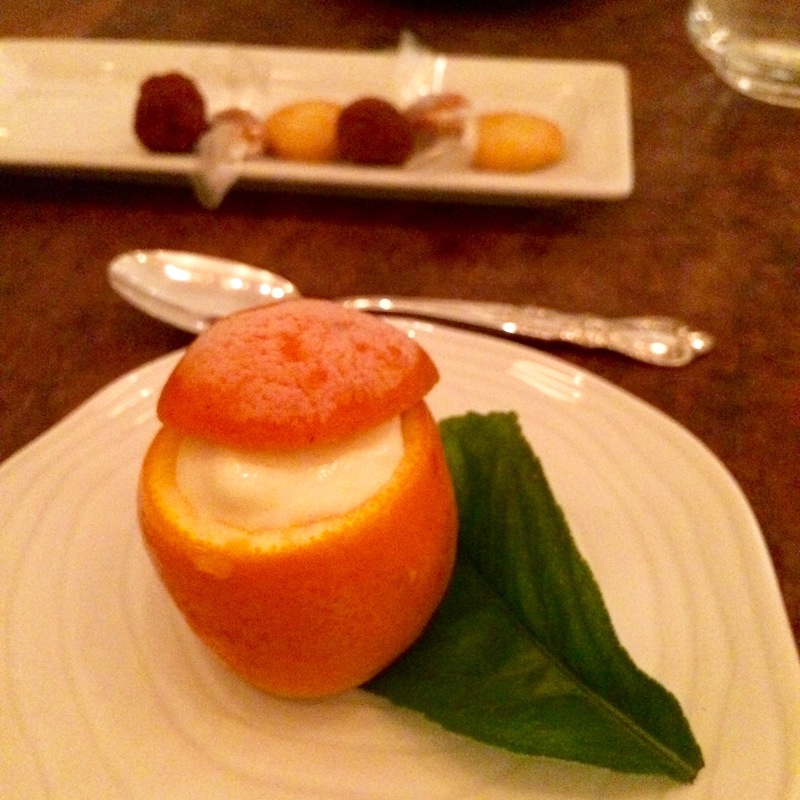 Dessert that night was comprised of a semi-frozen orange mouse filled in a hollowed-out shell. The orange leaf that it rested on was quite fragrant, adding an aromatic element to the rich yet seemingly light dessert. 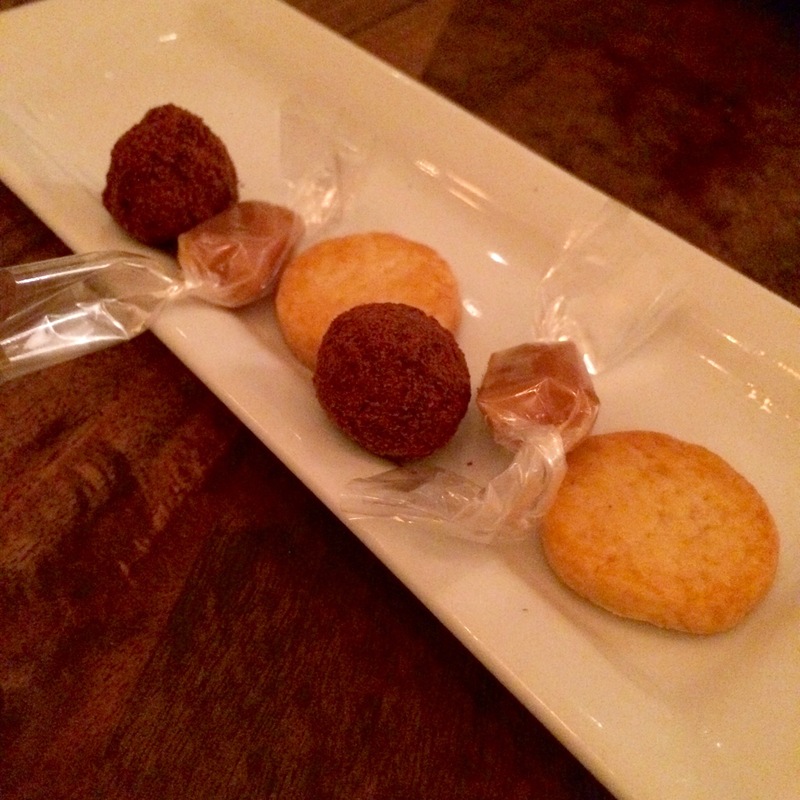 We ended up packing the Mignardise to go since we were pretty full from the whole experience. The nearly all-white decor is similar to the minimalist approach of Atelier Crenn. The pillows along the banquette evokes a homey feel, which is appropriate since dining there really feels like you are invited into Chef Crenn’s home. We enjoyed our dinner there so much that we decided to return for the a la carte experience at the bar. 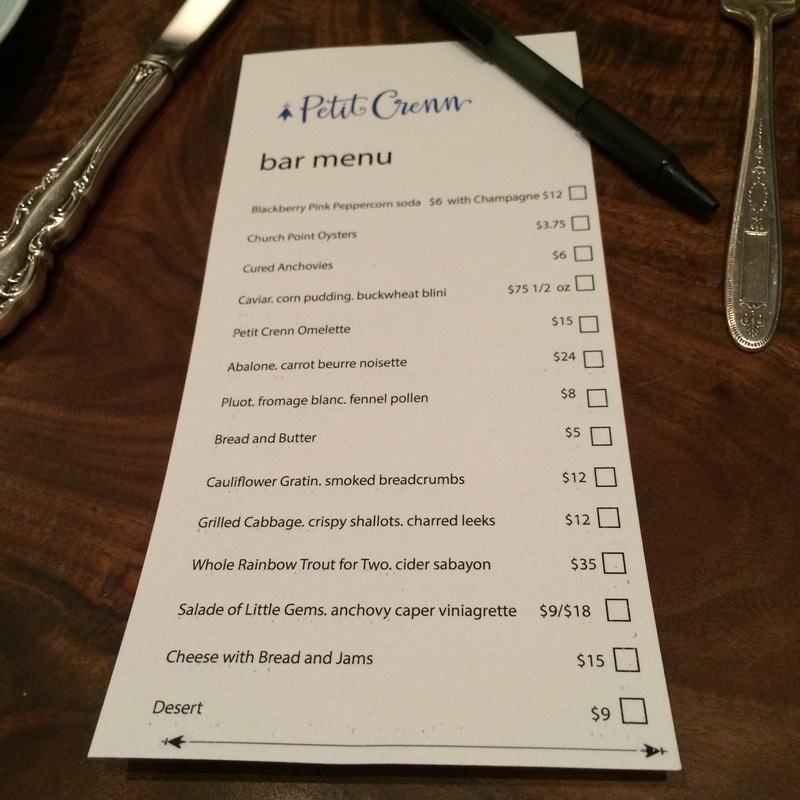 We were presented with a bar menu and a pen to check off items that we wanted. We were so intrigued by the omelet amuse bouche that we ordered the whole version this time around. 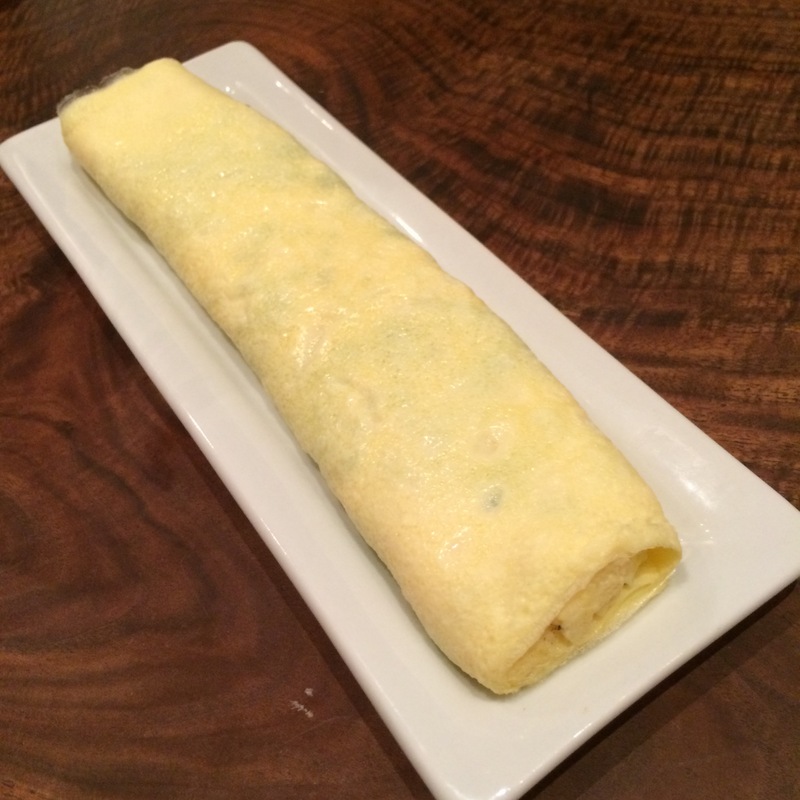 We watched the chef make it in a Japanese Tamago pan, with plenty of butter and tarragon sprinkled in while thin layer of scrambled egg is rolled up. 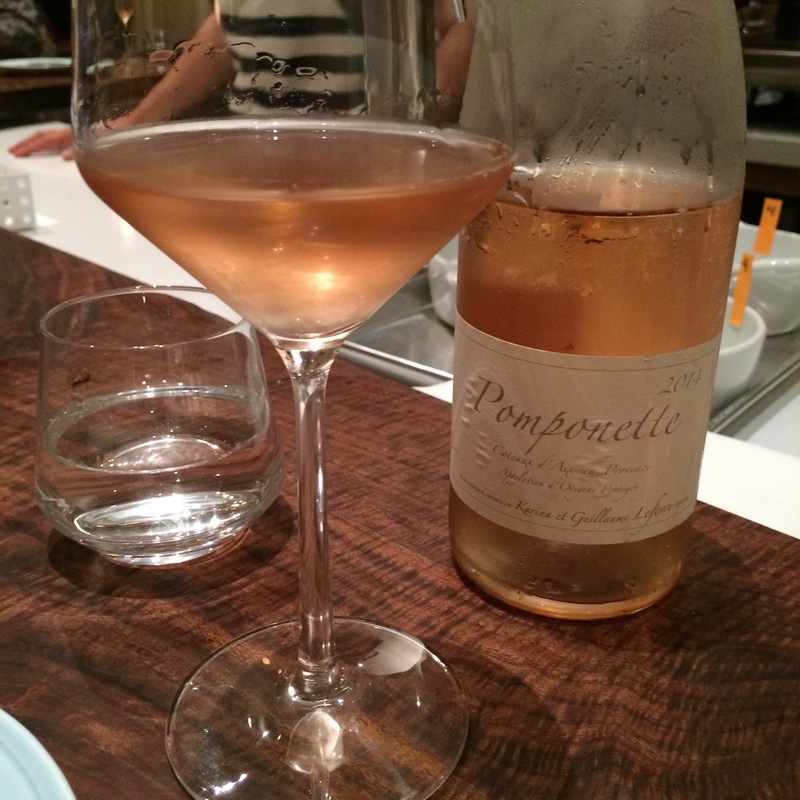 On this visit we opted to drink a 2014 bottle of the Provençal Pomponette Rose from Chateau Sulauze, which had citrus notes that paired very well with the trout and the rest of the dishes. In addition to re-rounding on the whole trout and the charred cabbage dishes, we ordered a lobster crudo dish that was available as a special for that evening. Of all the dishes we had so far at Petit Crenn, this had the most modernistic and tweezer-precision approach to the plating. 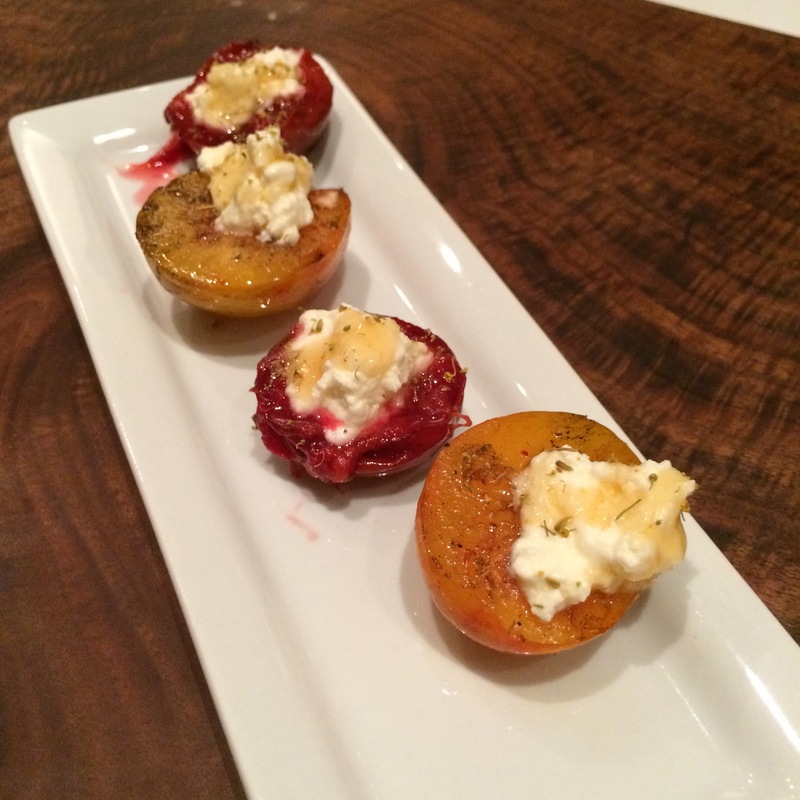 Following the main course, we received grilled pluots topped with fromage blanc, honey and fennel pollen. Although it was slightly savory, it was a dish that could easily straddle the cheese and dessert courses. 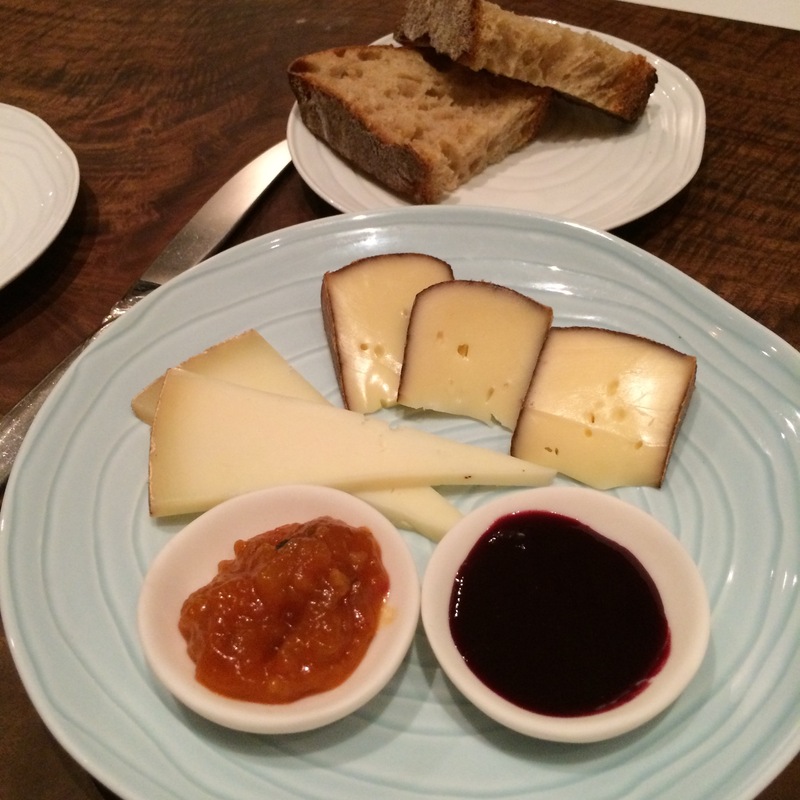 We also ordered the bread and cheese plate that came with house-made jams that had the right balance of sweet and tart. Sitting at the bar allowed us to view the choreography of plating the multiple courses for the all of the prix-fix diners. Shown here is the plating of the addictively-great cabbage dish. 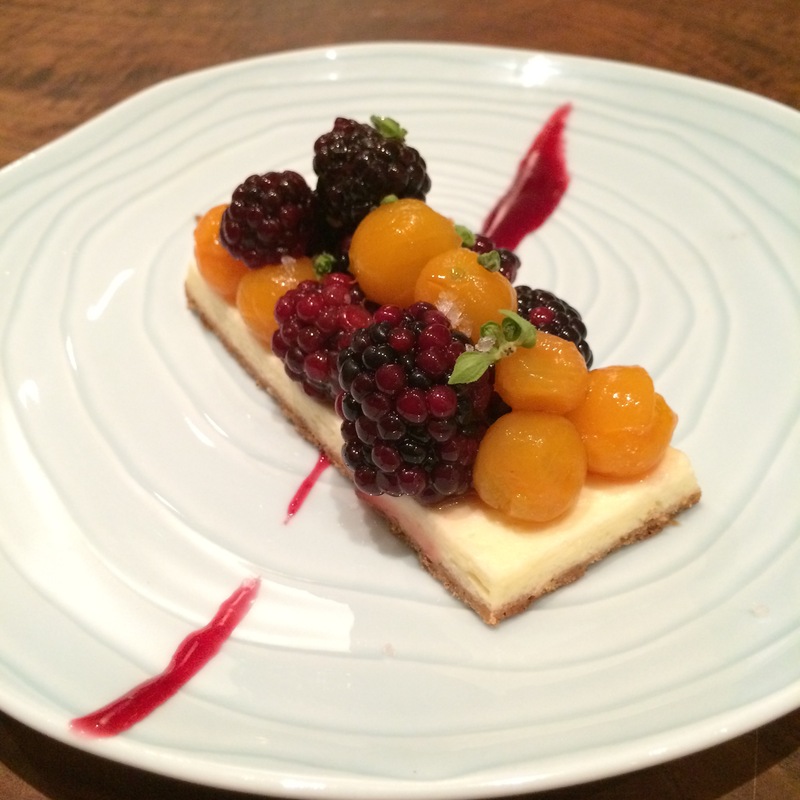 We were pretty sated at this point, but Chef Crenn came in and noticed that we were repeat diners so she had the kitchen provide us a gift of this beautiful and truly delicious berry tart. 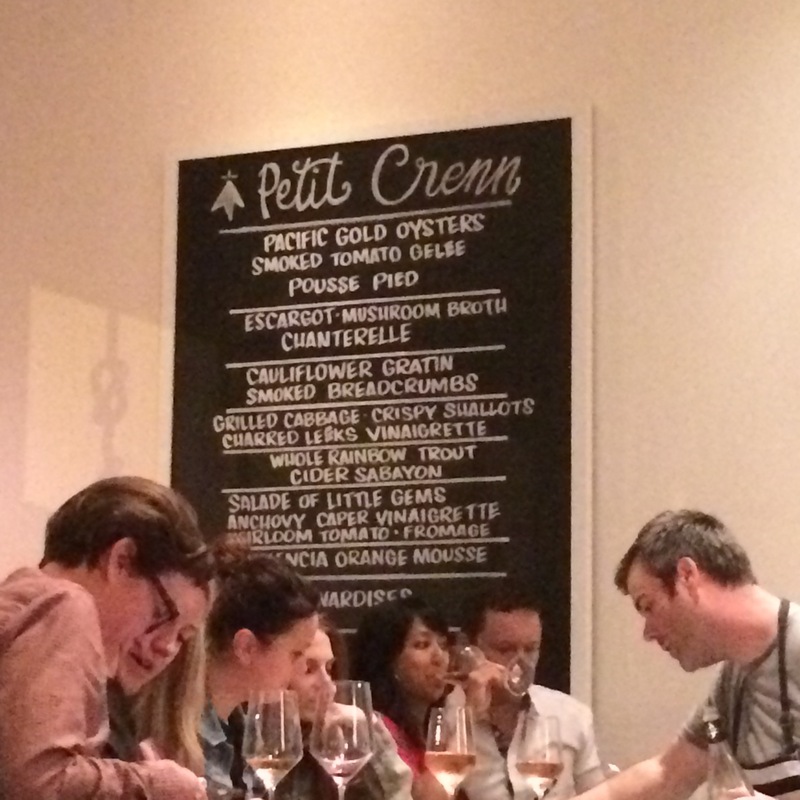 Petit Crenn is a welcome addition to the City’s dining scene. We have to admit that it might just be one of the healthiest and delicious multi-course meals we have ever consumed. 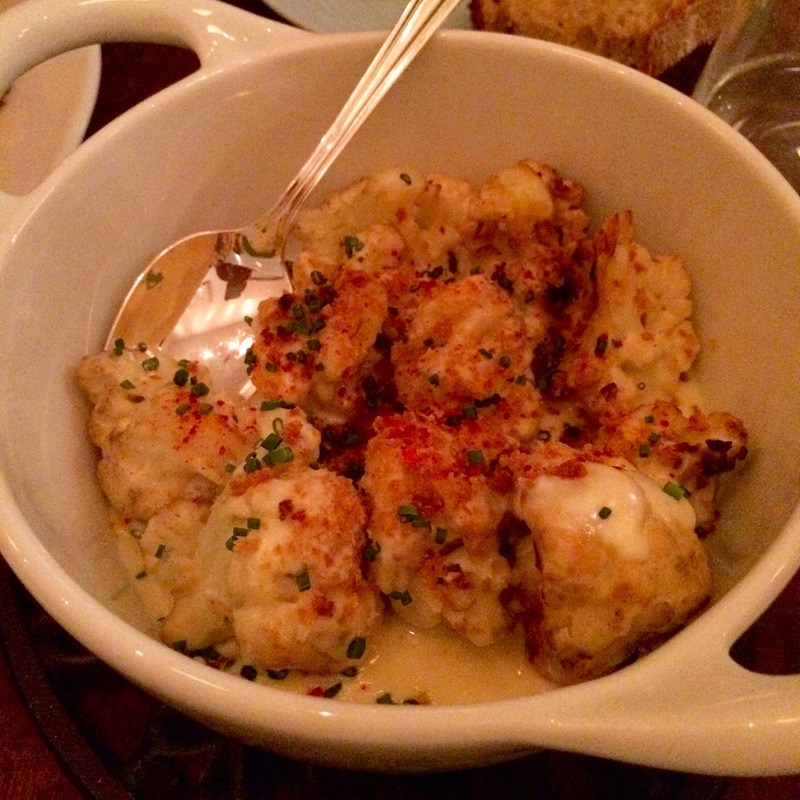 Given the quality of ingredients, it’s a great deal for $79 per person and will keep us coming back for more. They recently added breakfast and lunch hours, so we’ll have to swing by and try out their version of a Croque Monsieur – we would not be surprised if it’s the best one in the City!